So my husband and I had leeks last night in our dinner. It was a Paleo stir fry basically with leeks, carrots, sausage and eggs on top with and of course seasonings. When the leeks started cooking I did not like the smell at all. I’m not a fan of strong smells in the kitchen also it made me worry about the taste. Well when it was all said and done you really could not taste anything out of the ordinary so it really made my husband and I question the point of them being in the stir fry. If not for flavor did they have a really good health benefit? Well I had to look it up today and it just so happens that they do! They are really really healthy! I wish I would have known about them earlier. They are not to expensive and really easy to add to dishes without compromising flavor but adding health perks. 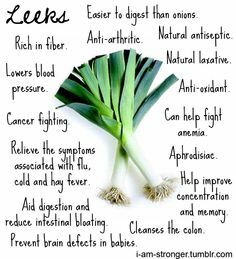 Leeks contain important amounts of the flavonoid kaempferol, which has repeatedly been shown to help protect our blood vessel linings from damage, including damage by overly reactive oxygen molecules. Interestingly, one of the mechanisms involved in this blood vessel protection may involve increased production of nitric oxide (NO), a naturally occurring gas that helps to dilate and relax the blood vessels, as well as decreased production of that asymmetric dimethylarginine (ADMA), a substance that blocks production of NO. Also present in leeks are impressive concentrations of antioxidant polyphenols. These polyphenols play a direct role in protecting our blood vessels and blood cells from oxidative damage. The total polyphenol content (TPC) of leeks averages about 33 milligrams of gallic acid equivalents (GAE) per 100 grams of fresh edible portion (FEP). By contrast, the TPC of red bell peppers averages 27 milligrams; cherry tomatoes, 24 milligrams; and carrots, 10 milligrams. So even though leeks are less concentrated than some of their fellow allium vegetables in terms of total polyphenols (garlic provides about 59 milligrams GAE/100g FEP, and onions provide about 76 milligrams), they are still a highly valuable food in terms of these phytonutrient antioxidants and provide us with important cardiovascular benefits for this reason. Unfortunately, leeks have received less research attention than their fellow allium vegetables (especially garlic and onions), and for this reason, there is less documentation of their likely health benefits. Given their substantial polyphenol content, including their notable amounts of kaempferol, we would expect to see overlap with garlic and onions in terms of support for many health problems related to oxidative stress and chronic low-level inflammation. These health problems would include atherosclerosis, type 2 diabetes, obesity, rheumatoid arthritis, and allergic airway inflammation. We would also expect to see leeks providing measurable amounts of protection against several different types of cancer, mostly likely including colorectal cancer. It’s important to remember that even in the absence of research studies to confirm health benefits, leeks still belong to the same allium vegetable family as onions and garlic and contain many health-supportive substances that are similar to (or identical with) the substances in their fellow allium vegetables. With a more delicate and sweeter flavor than onions, leeks add a subtle touch to recipes without overpowering the other flavors that are present. Although leeks are available throughout the year they are in season from the fall through the early part of spring when they are at their best. Cut off green tops of leeks and remove outer tough leaves. Cut off root and cut leeks in half lengthwise. Fan out the leeks and rinse well under running water, leaving them intact. Cut leeks into 2-inch lengths. Holding the leek sections cut side up, cut lengthwise so that you end up with thin strips, known as the chiffonade cut, slicing until you reach the green portion. Make sure slices are cut very thin to shorten cooking time. Let leeks sit for at least 5 minutes before cooking. Heat 3 tablespoons of broth in 10-12 inch stainless steel skillet until it begins to steam. Add 1 pound of cut leeks. Cover and Healthy Sauté for 4 minutes. Add 2 more tablespoons of broth, reduce heat to medium low, and Healthy Sauté for 3 more minutes uncovered while stirring frequently. Toss with 2 tablespoons of extra virgin olive oil, 1 teaspoon of lemon juice and salt and pepper to taste. To read more about leeks check out http://www.whfoods.com/ This is where I found all the information in this post.